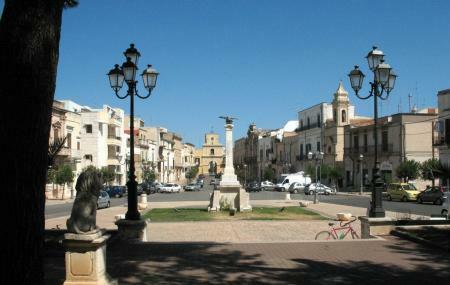 Adelfia or what the Italians call as Adelfie is an Italian commune in the city of Bari. Born out of the union of the two municipalities of Montrone and Canneto, the new city was named Adelaide meaning ‘brotherhood’ in Greek. Church of St. Mary, Montrone. Church of Our Lady of the Star, Canneto. Mother Church dedicated to St. Nicolas, Montrone. Mother Church dedicated to the Immaculate, Canneto. Castle of Fascina or Casina Don Cataldo, Canneto. Villa Monteleone or Gigia Villa, Canneto. Do not forget to check out the ancient prison for adulterous women. Those travelling in November can witness the “queen of the festivities” of Puglia held in honour of Montrone’s patron saint St. Tryphon. Check out the fabulous display of fireworks. Wine festivals are often accompanied with Jazz musicians and other cultural shows. People normally club together Bari War Cemetary and Convento Suore Crocifisse Adoratrici Dell'eucarestia while planning their visit to Adelfia.